In an important announcement, the Ministry of Immigration, Diversity and Inclusion (MIDI) has updated the processing fees for the applications received by Quebec for key immigration categories, i.e. Permanent Residency, Temporary stay programs, etc. The processing fee has been increased by 0.74 percent, which will be applicable with effect from January 1, 2017. Quebec is the largest province of Canada by area and second largest by population. It’s a crucial Canadian province in terms of economic contribution as well. It’s a bilingual province, where both English and French are spoken by people. Both the languages are official languages of Quebec. The province of Quebec runs its own immigration program, i.e. Quebec Skilled Worker Program (QSWP) under which, Quebec has the freedom to choose immigrants for temporary work as well as permanent residency in the province. The individuals who wish to get permanent residency in Canada as skilled worker, under the economic immigration program, require submitting application first for Quebec Selection Certificate (CSQ). The province of Quebec makes essential update in the fee annually for each category of immigration. As per Ministry of Immigration, Diversity and Inclusion (MIDI) the key amendments done in the fee are subject to the rise the consumer price index of Quebec for the period ending September 30, 2016. The fee amendments announced will have affect on the provincial processing of application only, however, the fee required at the federal processing stage will be as per the federal system only. 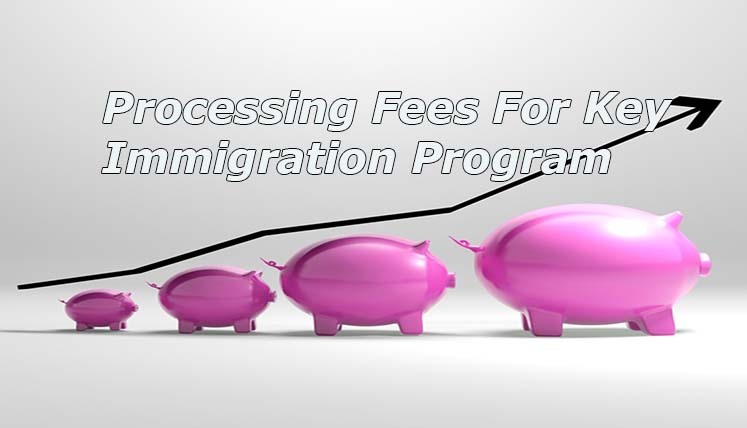 The fee has been increased by 0.74 percent for various immigration categories, i.e. Investor category, Entrepreneur and Self-employed worker, Skilled workers under Quebec Skilled Worker Program (QSWP) and Canadian Experience Class (CEC), Temporary Stays (i.e. Temporary Workers and International students, etc. ), and so on. Let’s take look at the fee changed for key categories. The Quebec Skilled Worker Program (QSWP) is the quite popular immigration program to get permanent residency in Canada. Quebec provides various relaxations to the applicants in the eligibility criteria, compared to other immigration programs of Canada. Hence, every year, thousands of candidates apply for PR through QSWP. The application intake for the year 2016 is already capped. However, in 2017, the QSWP will open with a new quota of applications. We may possibly see the first QSWP intake in the first quarter of 2017. So, if you wish to apply in QSWP, get your file prepared quickly in coordination with an experienced and trusted Immigration consultant for Canada. Visas Avenue is a genuine, registered, and trusted Visa and Immigration Consultancy Company for Canada. It every year, helps a huge number of applicants to move to Canada after obtaining the desired visa. You may call the Visas Avenue immigration expert on 011-48447777, 011-46194650 (Delhi), 040-42467777 (Hyderabad), or 080-46668222 (Bangalore). Visas Avenue office branch shall soon open in Mumbai city as well. You can also forward your immigration associated queries at Visas Avenue email id- info@visasavenue.com for quick and relevant reply from the expert. How to prepare for Canada PR in 2017 with Recent Rule Changes?